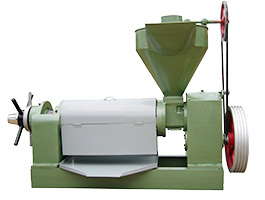 The screw oil press is used to press soybeans, cottonseed, peanut kernels, sesame seeds, and rapeseed and is ideal for the small rural oil mill. Here are some troubleshooting tips for these machines. 1) If the pressing bar is tightly assembled or the gap between which is blocked by oil residue and dregs, cleaning must be done timely, or readjust the tightness of the pressing bars. If the oil returns to hopper, material should be stopped to put in, instead add cakes into chamber to drive oil off and continue to work. Or you can discharge the oil from the discharge gate and readjust the components on the chamber, and then turn on the machine to press. 2) If the raw material is high in oil, but the cake is too thin to let the oil go through the gap and store in the chamber or hopper. 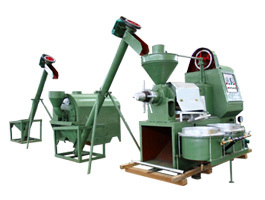 Then operate the machine according to the raw material seeds high in oil. Cakes should be thick; on the other hand it must be thin. 1) If the raw material is too dry and residue discharged from the gaps increased, at this time, you need readjust the water content in the raw material. 2) If the raw material is too wet, the pressure can’t be formed and the oil residue can’t be separated, and if the gap for discharging oil is too wide at this time, the residue will be squeezed out. Then the water content of the oil material and the tightness of the pressing bar should be readjusted. 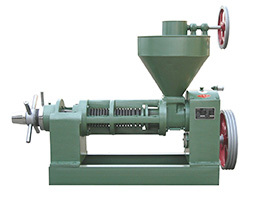 1) If the raw material is too wet or too dry, affected with damp and go moldy, the kernels are hollow or the impurities are too much the raw material or the water content in the raw material should be readjusted. 2) If the gap for oil discharging is blocked, it must be cleaned and readjust the tightness of the pressing bar according to the oil content. 3) If the components had been worn down, they must be replaced by the new ones. 4) If the cake is too thin or too thick, the thickness should be readjusted or change the output condition. 5) At the beginning of the pressing, if the temperature is too low, it must be elevated. 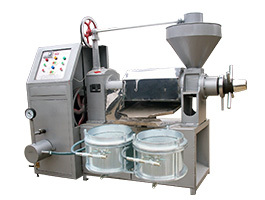 1) If feed too much material at the beginning, you can add the pan-fried oil material seeds to the machine and grinder repeatedly to remove some. 2) In the process of the pressing, if the chamber is out of material, it is because feed too much material in the hopper. So the material should be added continuously and well-distributed. And once it blocked, cut the electric power source at once and stop to feed and open the feed plate, and then withdraw the screw shaft, clean the chamber and continue to repress. 1) The cleanliness of the raw material is not clean enough, perhaps sands or impurities enter in to the chamber. 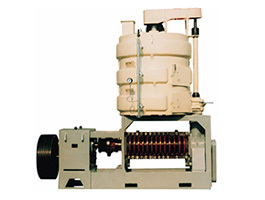 2) Screw shaft or the cake outlet is not smooth that it affects feeding and cake outputting. It can be polished with the grinding wheels, or blend some corns with big friction coefficient into the cakes and add right amount water. Then turn on the machine and feed the material gradually to polish the grinding wheel. 3) If the speed of the screw shaft is too fast or too slow, adjust it until it conform to the rules.4) If the screw shaft had been polished, the components should be exchanged.